Archaeological excavations since 1900 have revealed that Abu Mena grew rapidly in the course of the fifth and sixth centuries. By 600 A.D. the oasis had become a pilgrimage city, centred around the great basilica complex erected over the saint's burial place. Sick people from all over the world, used to visit that city and were healed by the intercession of St. Menas, the miracle-maker. The old monastery and city of Abu Mena are located south of Alexandria, between Wadi el-Natrun and Alexandria. St. Menas' remains were brought here by a camel and were buried where the animal refused to walk any more. A water well in the desert came up from that spot. These water wells made the area full of vines and olive trees. It was an oasis called St. Menas Vineyards. Today, only ruins and the desert are the witness of once a beautiful oasis and pilgrimage site. Built in the fifth century to accommodate the increasing number of Christian pilgrims, the Thermal Basilica used to store the curative waters which were used for the heated baths and pools surrounding the Basilica. Pilgrims used to fill tiny flasks with water from the Basilica. The flasks were stamped with the seal of St. Menas. The seal was a picture of St. Menas standing between two kneeling camels. During the 5th and 6th century, many buildings were built around the Thermal Basilica. A 48,000 square yard monastery was built to the north side of the Basilica. Archeologists excavated an entire town with houses and cemeteries. They even found the house of the potters who made the flasks, the shop, and the remains of some flasks, lamps and toys. 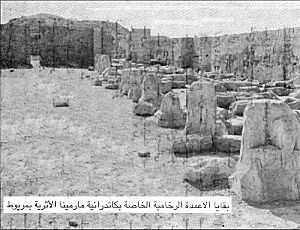 Abu Mena - Marble column remains. Built in the fifth century, the Basilica of Arcadius was built in the centre of a glamorous complex just south of Alexandria in Karm Abu Menas. Its roof is supported with 56 marble columns. The Baptistery is located in the western end of the Basilica with corners rounded in semicircular, polychrome marble niches. This is the only Coptic monument that shows the use of these elements in ancient Christian architecture. A church is located in the west side of the Basilica with a strong Egyptian and Byzantine architectural influence.